Ayurveda, the science of health is India’s promised gift to the world. Health through Ayurveda is holistic and complete. Ayurveda is the answer for many illnesses before which other systems have blinked blank. In many incurable irreversible diseases Ayurveda is the only hope for the improvement in the quality of life, stretching the life expectancy and management of the symptoms. For authentic traditional Ayurveda, Kerala is the destination. The nation and the world converge in Kerala seeking Health through Ayurveda. Jeevaniyam Ayurveda understands the responsibility of the host and hence packaged Jeevaniyam Health Tourism or JHT as is famously known in our client circles. JHT is the exclusive segment of Jeevaniyam Ayurveda envisaged for propagating, promoting and prioritising Ayurveda Health Tourism. 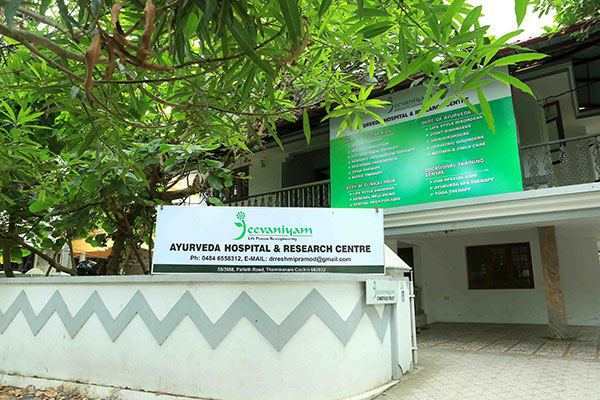 As part of the itinerary of this innovative tour program, a customized circuit travel is organised to Jeevaniyam Ayurveda hospitals to familiarise the guest with Ayurveda and Ayurveda treatments offered at Jeevaniyam Ayurveda hospitals. The guests get an opportunity to interact with our experienced Ayurveda physicians and discuss their health concerns. Special Kerala food incorporating Ayurveda principles and visits to the scenic locales around our centres also form part of our JHT itinerary. Special relaxing relieving rejuvenating Ayurveda treatments like massages, Shirodharas and facials are optional value additions to the tour. We also provide assistance for consultation with specialists of modern medicine at premier allopathy hospitals. Yoga and Meditation-Relaxation sessions are also included in the tour program. The specially designed JHT tour packages help the clients in imbibing the positive energy of the destination clinically, aesthetically culturally and geographically. The richness of Ayurveda, heritage of Kerala culture and the feel of oneness with nature combine together and work to wave the magic wand of health on the mind, body and soul of the JHT guest. Jeevaniyam Health Tourism provides the ultimate best in luxury, safety and comforts to its JHT guests through its premier associate centres spread across popular destinations in Kerala or in coordination with Kerala Tourism. JHT is indeed a unique blend of modern day comforts with the traditional science of Ayurveda. A pampering caring team of Jeevaniyam Ayurveda is always ready to be at your service during the Ayurveda Courses of your JHT itinerary to provide you a WOW experience when you board your transport to get back home cherishing the memories of the best healthiest days of your lives!!! !